Mr. Skipper came in from Taiwan for one night before flying out to Toronto for a week. Dragging along MomJ, we met up with Mr. Skipper at the restaurant to catch up with the latest gossips. 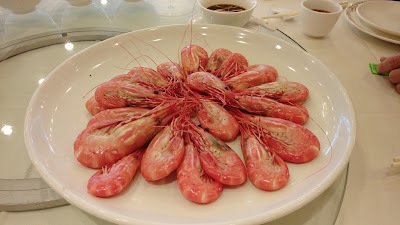 Because I'm still quite restricted with certain types of seafood, we only order one and a half pounds of Spot Prawns 斑點蝦. These were simply blanched and served with a dipping blend of soy sauce, scallions, chili and sugar. I recently read a local Chinese blog where the blog owner translated Spot Prawns 斑點蝦 (Pandalus platyceros) as Botan Ebi 牡丹蝦 (Pandalus nipponensis) in Chinese. Do not be fooled by this as this is a typical misconception. These two types of prawns are close relatives but have different characteristic in appearance, texture and taste. Generally speaking, the true Botan Ebi 牡丹蝦 (Pandalus nipponensis) can only be found mostly in Hokkaido due to its limited supply. In other places of Japan and other parts of the world, most of the Botan Ebi are imported from Russia or Korea. The reason why Spot Prawns 斑點蝦 (Pandalus platyceros) are popularly known as BC Spot Prawns is because of the sustainable fisheries along the BC coast. But these prawns are also commonly found along the north Pacific waters from San Diego all the way up to Unalaska Island, therefore, these crustacean are also known as California Spot Prawns or Alaskan Prawns. Anyhow, back to our meal. 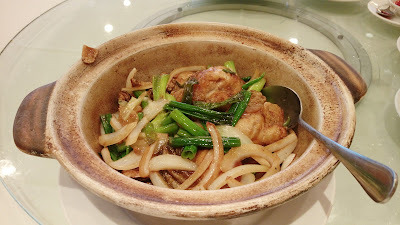 Next came Buddha Boy's favorite Crab Meat & Fish Maw Soup 蟹肉魚肚羹. The soup had the right consistency with reasonable amount of crab meat but inadequate amount of fish maw. 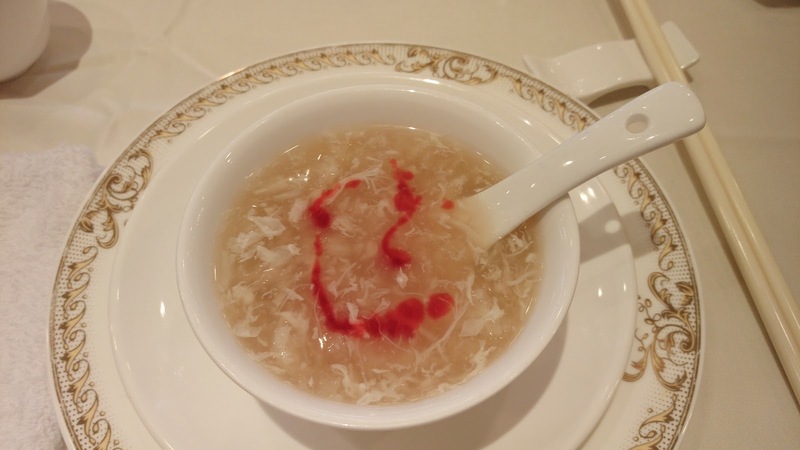 We've always enjoyed this savory soup in our previous visits, but we were quite disappointed this time as the soup was very bland. All four of us had to use white pepper and red vinegar to enhance the taste. MomJ wanted some vegetables but her kids were only open to Pea Tips in Broth 上湯豆苗. The greens were fresh and crisp. The garlic didn't do much in taste. 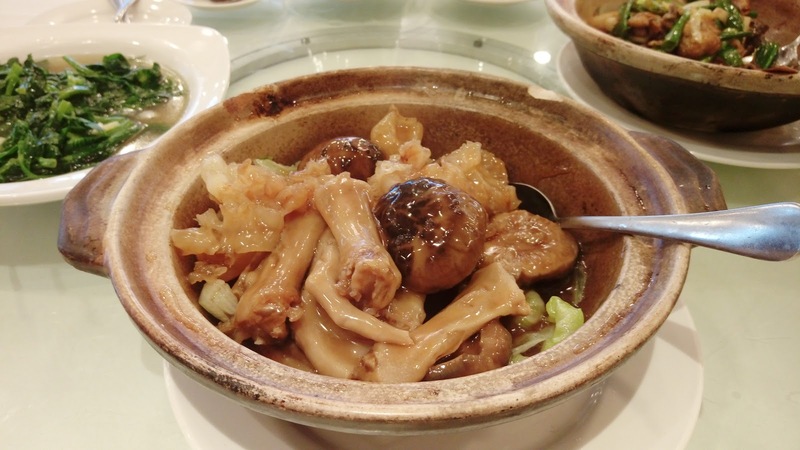 The Oyster with Ginger & Onions Pot 薑蔥生蠔煲 has become a dish I must order every time I visit Empire. 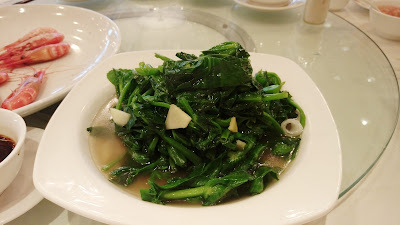 With pleasing wok-hei 鑊氣, these plump and succulent oysters were infused with all the aromatic savoriness of soy sauce, ginger, scallions and onions. A simple dish done well. The Fish Maw & Goose Feet Pot 花膠鵝掌煲 was disappointing. 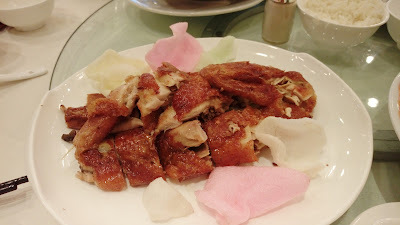 The fish maw chunks were fishy with an awkward chewy texture that wasn't gelatinous. Mr. Skipper educated us that these bladder chunks were from cheap and low quality fresh water fish. 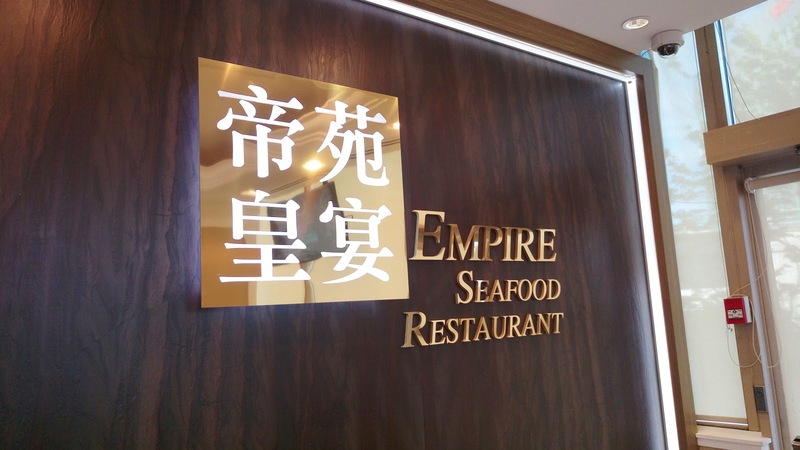 Mr. Skipper was quite surprised that an upscale Chinese seafood restaurant, such as Empire, uses such a low quality fish maw. Mr. Skipper knows his stuff . 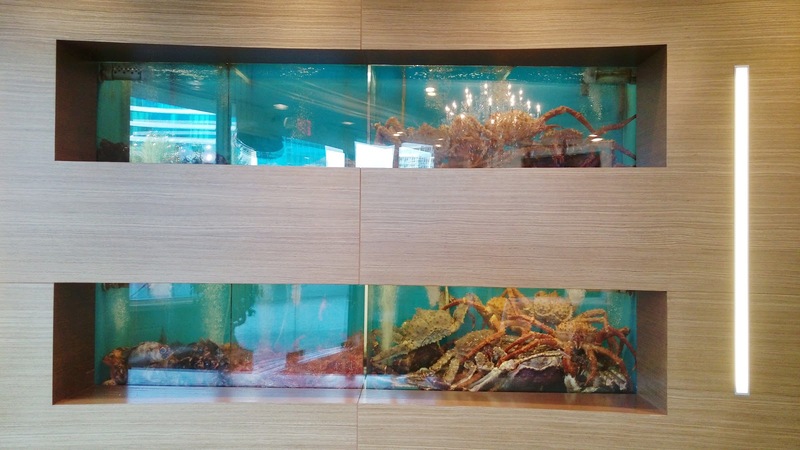 Not only he owns a large seafood import/export business between North America and Asia, he also owns a number of vessels that fish/catch in the open oceans. He has pampered us with yummy delicacies such as sashimi grade toro loins of Southern Bluefin Tuna (Thunnus maccoyii) and the eyes of Bigeye Tuna (Thunnus obesus). Yes, we are spoiled. 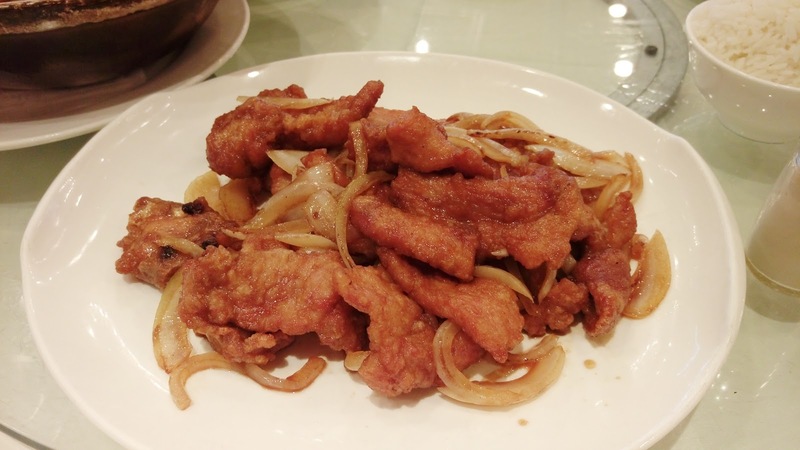 To satisfy his need for something meaty, Buddha Boy ordered the Pork Chop in Sweet Sauce 京都肉扒. These chops were coated gently with a savory blend of ketchup and soy sauce. The onions were visible, but didn't expose much in taste. The chops were meaty but the dish was not very big. 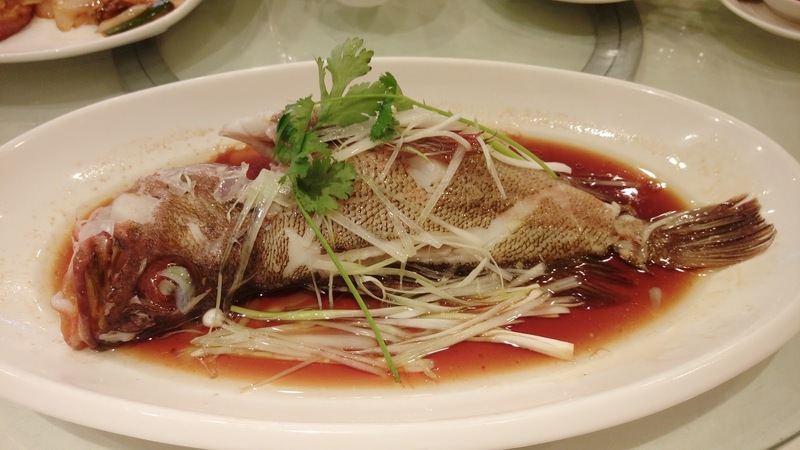 Since we know our captain, Mr, Skipper, could not live one day without some kind of fish, MomJ ordered a Steamed Redstripe Rockfish 清蒸蝦斑 (Sebastes proriger 紅帶平鮋). The meat was delicate and smooth. The finishing blend of soy sauce, vinegar, oil, ginger, scallions and cilantro did not overpower the fresh sea taste of the fish. Job well done. We weren't too happy with the Ying-Yang Fried Rice 鴛鴦炒飯. 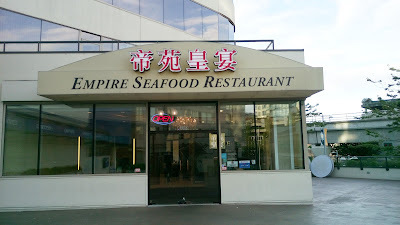 The fried rice itself was fine, but the sauces were disappointing. The red blend, consisted of onions and shredded pork, was overly sweet from the overuse of ketchup. 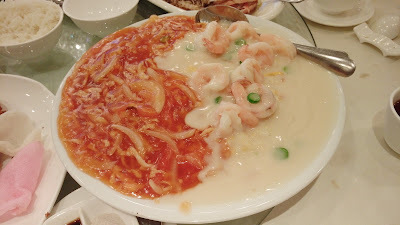 While there were generous amount of shrimps, the not-so-creamy cream sauce was very runny and bland. Not recommended. After a quick reminder to our server, our half order of Crispy Chicken 炸子雞 finally showed up. The bird was overcooked. The skin was crispy but the meat was dry and tough. Not impressed. I was dumb. I assumed that we didn't really need a reservation on a Friday night since it's a big restaurant...I was wrong. Luckily, a table left just before we arrived so we were quickly seated after the servers cleaned and set the table. Empire Seafood Restaurant 帝苑皇宴海鮮酒家 has an open floor plan which made the restaurant one of the most ideal places for Chinese banquets (no annoying posts/beams). Reasonable price points for its regular/banquet menus are comparable to similar scale restaurants. Service has always been pleasant and courteous, no matter whom we dealt with. Just like any restaurants, food can be hit and miss, but as long as we have more hits, we will continue to visit.